Are you ready for another Ivy Bridge-based system? Today, we’re launching a new high-performance desktop—the XPS 8500. We made this machine for you, the desktop enthusiasts out there. Our goal was to bring you the latest technology and give you plenty of room to upgrade. We used a lot of your feedback on the XPS 8300 to make the XPS 8500 an even better machine. It’s available in the United States starting at $749 and will be available in many countries around the world later this week. From a technology perspective, the XPS 8500 desktop is powered by Intel 3rd generation i5 and i7 quad core processors—otherwise known as Ivy Bridge. As you’d expect, we paired the processing power with great GPU options as well. And we also wanted to provide lots of storage flexibility, so we support up to 3TB of internal storage. That means you can store all those pictures from your digital SLR or true HD videos you encoded without any worry of running out of disk space. The high-end configurations feature the powerful AMD HD 7870 discrete graphics card with 2GB memory and gives you the power to breeze through intense video and photo editing applications. To ensure the system doesn’t get slowed down elsewhere, the XPS 8500 currently provides the option of 16GB DDR3 memory, and will support up to 32GB support in future. A 32GB SSD – The 32GB SSD which utilizes Intel Smart Response Technology (SRT). It’s a caching technology which makes the boot process faster and helps load applications quicker. On the XPS 8500 we saw a boot time improvement of 2.5X, over a traditional HDD only system! That’s right, you will have access to your data faster than ever before. A 256GB SSD – Beyond the fast boot times, this option increases the system performance. For the XPS 8500, the OS image resides on your SSD drive while your traditional HDD is used to store all your personal files (music, images, documents videos) etc. We saw a 60% performance increase from traditional HDD in our benchmark analysis. We added 2 front USB 3.0 ports on the front of the system and 2 more on the back to give you more access to the devices. Additionally, the system has 5 USB 2.0 ports that allow you to make the XPS 8500 a multimedia hub. One port I use most often is the one that utilizes USB PowerShare functionality so I can charge my cell phone without turning on the machine or resuming it from sleep/ hibernate mode. Just so convenient! From a software perspective, we focused on removing bloatware to streamline the software load on the XPS 8500. That way, you can focus more on the experience of using the power a machine like the XPS 8500 provides. We’ve also worked to provide some compelling peripheral options. One example: the XPS 8500 has a chic wireless keyboard that’s simple to configure and use. It doesn’t get in your way and I love that! We do offer a 24” monitor and several other larger options if you need to go bigger. Other options like the external Bose speaker are a great complement to the Waves MAXX Audio functionality that comes standard with all these machines. With that setup, your XPS 8500 can fill up just about any room with quality sound! I know there are some of you out there who have an affinity for desktops and the flexibility they provide. You tend to be drawn to power and performance and need machines that can stand up to all kinds of strenuous computing demands. We designed the XPS 8500 with you in mind. 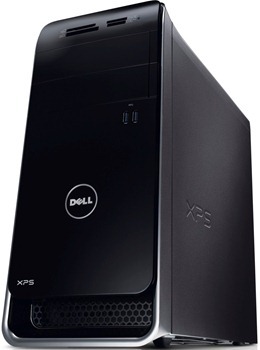 You can check out more images of Dell’s newest machine by clicking on the XPS 8500 desktop album on Dell’s Google+ page. Would love to hear your questions and feedback!